The machine you are looking at. It might be a PC, laptop, tablet or smartphone — they are all based on the same principle, though with different forms of input and output. These machines can process photographs, set up your wireless, send emails, set up secure encipherment for on-line payments, do typography, refresh the screen, monitor the keyboard, manage the performance of all these in synchrony... and do all of these things through a single principle: reading programs placed in the internal storage. Everyone knows: computers come into every aspect of modern life. But the meaning of the word 'computer' has changed in time. In the 1930s and 1940s 'a computer' still meant a person doing calculations. There is a nice historical example of this usage here. So to indicate a machine doing calculations you would say 'automatic computer'. In the 1960s people still talked about the digital computer as opposed to the analog computer. The world's computer industries now make billions out of manufacturing better and better versions of Turing's universal machine. But Alan Turing himself never made a point of saying he was first with the idea. And his earnings were always modest. Picture from a Japanese graphic book of Turing's story. So I wouldn't call Charles Babbage's 1840s Analytical Engine the design for a computer. It didn't incorporate the vital idea which is now exploited by the computer in the modern sense, the idea of storing programs in the same form as data and intermediate working. His machine was designed to store programs on cards, while the working was to be done by mechanical cogs and wheels. There were other differences — he did not have electronics or even electricity, and he still thought in base-10 arithmetic. But more fundamental is the rigid separation of instructions and data in Babbage's thought. 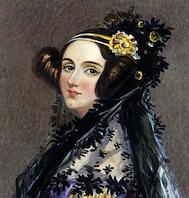 Wikipedia: Charles Babbage and Ada Lovelace. Babbage website maintained by his biographer A. Hyman. Ada Lovelace's descriptive notes on the Analytical Engine, including an algorithm for calculating Bernoulli numbers. A hundred years later, in the early 1940s, electromagnetic relays could be used instead of gearwheels. But no-one had advanced on Babbage's principle. Builders of large calculators might put the program on a roll of punched paper rather than cards, but the idea was the same: you built machinery to do arithmetic, and then you arranged for instructions coded in some other form, stored somewhere else, to make the machinery work. To see how different this is from a computer, think of what happens when you want a new piece of software. You can download it from a remote source, and it is transmitted by the same means as email or any other form of data. You may apply an Installer program to it when it arrives, and this means operating on the program you have ordered. For filing, encoding, transmitting, copying, a program is no different from any other kind of data — it is just a sequence of electronic on-or-off states which lives on hard disk or RAM along with everything else. The people who built big electromechanical calculators in the 1930s and 1940s didn't think of anything like this. I would call their machines near-computers, or pre-computers: they lacked the essential idea. Even when they turned to electronics, builders of calculators still thought of programs as something quite different from numbers, and stored them in quite a different, inflexible, way. So the ENIAC, started in 1943, was a massive electronic calculating machine, but I would not call it a computer in the modern sense, though some people do. This page shows how it took a square root — incredibly inefficiently. I wouldn't call it a computer either, though some people do: it was a machine specifically for breaking the Lorenz machine ciphers, although by 1945 the programming had become more flexible. Konrad Zuse, in Germany, quite independently designed mechanical and electromechanical calculators, before and during the war. He didn't use electronics. He still had a program on a paper tape: his machines were still developments of Babbage-like ideas. But he did see the importance of programming and can be credited with a kind of programming language, Plankalkül. Like Turing, Zuse was an isolated innovator. But while Turing was taken by the British government into the heart of the Allied war effort, the German government declined Zuse's offer to help with code-breaking machines. The parallel between Turing and Zuse is explored by Thomas Goldstrasz and Henrik Pantle. Their work is influenced by the question: was the computer the offspring of war? They conclude that the war hindered Zuse and in no way helped. Konrad Zuse, 1910-1995, with the Z3. 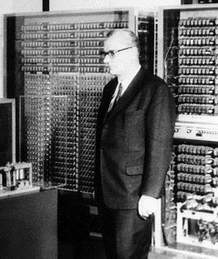 But the significant development is that of a computer in the modern sense, designed from the start to be Turing-complete. This is what Turing and von Neumann achieved. Alan Turing, on the basis of his own logical theory, and his knowledge of the power of electronic digital technology. the EDVAC report, by John von Neumann, gathering a great deal from ENIAC engineers Eckert and Mauchly. Download the EDVAC report in pdf form. They both saw that the programs should be stored in just the same way as data. Simple, in retrospect, but not at all obvious at the time. John von Neumann (originally Hungarian) was a major twentieth-century mathematician with work in many fields unrelated to computers. This is a great irony of history which forms the central part of Alan Turing's story. His war experience was what made it possible for him to turn his logical ideas into practical electronic machinery. Yet he was the most civilian of people, an Anti-War protester of 1933. He was very different in character from John von Neumann, who relished association with American military power. But von Neumann was on the winning side in the Second World War, whilst Turing was on the side that scraped through, proud but almost bankrupt. Where did von Neumann get the idea? See these source documents on what von Neumann knew of Turing, 1937-39. He knew Turing at Princeton in 1937-38 (see this Scrapbook Page.) By 1938 he certainly knew about Turing machines. Many people have wondered how much this knowledge helped him to see how a general purpose computer should be designed. The logician Martin Davis, who was involved in early computing himself, has written a book The Universal Computer, The Road from Leibniz to Turing. Martin Davis is clear that von Neumann gained a great deal from Turing's logical theory. So who invented the computer? There are many different views on which aspects of the modern computer are the most central or critical. Some people think that it's the idea of using electronics for calculating — in which case another American pioneer, Atanasoff, should be credited. Other people say it's getting a computer actually built and working. In that case it's either the tiny prototype at Manchester, (See this Scrapbook Page) or the EDSAC at Cambridge, England (1949), that deserves greatest attention. But I would say that in 1945 Alan Turing alone grasped everything that was to change computing completely after that date: above all he understood the universality inherent in the stored-program computer. He knew there could be just one machine for all tasks. He did not do so as an isolated dreamer, but as someone who knew about the practicability of large-scale electronics, with hands-on experience. From experience in codebreaking and mathematics he was also vividly aware of the scope of programs that could be run. But that is exactly how it has turned out. It is amazing, although we now have come to take it for granted. But it follows from the deep principle that Alan Turing saw in 1936: the Universal Turing Machine. Of course, there have always been lousy predictions about computers. I follow the second viewpoint: the essential point of the stored-program computer is that it is built to implement a logical idea, Turing's idea: the Universal Turing machine of 1936. Turing himself referred to computers (in the modern sense) as 'Practical Universal Computing Machines'. This Scrapbook page has emphasised the importance of Turing's logical theory of the Universal Machine, and its implementation as the computer with internally stored program. But there is more to Turing's claim than this. He designed his own computer in full detail as soon as the Second World War was over. What Alan Turing planned in 1945 was independent of the EDVAC proposal, and it looked much further ahead.